Diane Marsh’s paintings, many of them self-portraits, convey a consistent and inconsolable anguish, as well as a parallel transformation. They are more than portraits. The emotional depth, or density, of her art is unfamiliar and disturbing. The viewer is almost an intruder, privileged and perhaps reluctant to share the pain. Yet despite the specificity of every subject, Marsh reaches for the portrayal of a broader humanity, psychological experiences that we can recognize and identify with. Although a muted sorrow continues to pervade the paintings to this day, hope hovers too. The time taken for each meticulously realist work (Marsh completes only two or three paintings a year) is an integral element of the work, woven almost visibly into the content. Although landscape is always in the background it is rendered with such loving detail that it plays a significant role, another layer of portrait—portraits of a place, of New Mexico, of Abiquiu and Roswell, where vast and very different spaces literally offer new horizons, new possibilities. The notion of place as a spiritual antidote, nature as a sanctuary, is familiar in the ancient cultures of the southwest, in its art and its continuous allure for those of us from elsewhere. Sorrow is not denied, but acknowledged and transcended by earth, water, sky. In a sense Marsh’s work is a plea for understanding, a personal and unifying need or desire that is offered to the viewer as a gift. A select group of high school students works with the Museum of Nebraska Art staff to conceptualize, choose, and install an exhibition of artworks drawn from MONA’s collection. The experiential learning expands their knowledge of art, museums, and careers. Silent Ways of Speaking is based on the emotional content of art. The students chose pieces that stir an emotional reaction as well as ones that have emotional content, allowing viewers to create their own interpretation. "EARTH MOTHER: Artist Promotes Need to protect nature in her paintings"
In more than two decades as a painter; through times when her possessions were meager and the marketplace was indifferent, Diane Marsh has refused to compromise. Art for the Abiquiu denizen, is a calling not a career, a venue for articulating deeply held values rather than a revenue source. Some collectors find her work too confrontational, yet others stand before it moved to tears. Tonight Marsh-whose pieces are in collections at the Albuquerque and Roswell Museum, Santa Fe's Museum of Fine Arts and Capitol Art Collection-is featured alongside painter Duane Slick, at Addison Arts. She is best known for her hyper-realistic portraits of people captured in moments of emotional angst, paintings that convey her belief that humans can only evolve by facing their pain and suffering. With the birth of her son, Marsh’s focus has shifted. Her thoughts have turned to the state of the environment and what will be left of planet Earth to pass on to the next generation. Set at Bitter Lake reservoir in Roswell, her recent oil “Sanctuary,” depicts a mother passionately embracing her young son, their faces a mix of serenity and desperation. The painting alludes to the state of the natural world and suggests that the Earth, like the mother can be a source of comfort and refuge. “The Weeping Drawer,” a portrayal of a dispirited woman with hands clasped, perhaps in prayer, contains a working drawer. Inside are three small paintings-the Earth on fire, and antelope with an arrow in its neck and an image of a child. Marsh’s message is clear: we must honor our connection to nature of risk disaster. All the canvases are crafted with meticulous detail that requires hundreds of hours of painting time and assiduous study of the human body. Marsh and her son are models for much of the work but, the artist emphasizes, these are not self-portraits. Her figures are meant as archetypes for all human beings. Growing up in Buffalo, N.Y., art and nature were Marsh's passions. After earning a graduate degree in paintings, she moved to New York City to live in the eye of the art world and was lured to Roswell by an artist-in-residence fellowship. KEARNEY  Giant rosaries rest on the floor, and a cross covered with nails hangs from the ceiling. Paintings of emotionally exposed people paired with quiet environments or "blank" spaces hang on the walls. A set of praying hands, one gold, the other red and looking like fire, sits on a pedestal. That is the view that immediately confronts visitors to "Diane Marsh & Eddie Dominguez: Parallel Perceptions of Land, Form and the Natural Condition," a striking Museum of Nebraska Art exhibition that features the work of painter Marsh and her husband, ceramicist Dominguez. The work in the show was not done at the same time. Marsh's paintings date as far back as 1988, and more than half were completed in the 1990s, while all of Dominguez's ceramics were done in the last two years. But they nonetheless inform and powerfully reinforce each other. Dominguez's rosaries, made on 20-foot strands of rope, have obvious religious roots. The rosary itself is a religious object used in daily devotion, and Dominguez adds additional Catholic iconography to the pieces with nails covering the beads on "Nail Rosary," a reference to the crucifixion that is repeated in the hanging "Nail Crucifix," and bright red ceramic beads representing drops of blood in "Sangre de Christo." Those pieces give the exhibition a distinct spiritual underpinning. But that sensibility takes on additional resonance when seen with Marsh's realist imagery of the faces of men and women who seem to be exposing the rawest of emotions. Created by subjects "acting," the portraits are nonetheless gripping, emotionally honest images, whether it is one of four Marsh self-portraits, such as "Moving Toward Light," which shows the artist lying on her back in water, her eyes clinched shut, or the repeating images of her other subjects, including the man in "Deep Into His Distance," a painting that is part of the Sheldon Memorial Art Gallery collection. As if to put a point on the fact that her paintings have a spiritual underpinning, Marsh scratches a quote from Krishnamurti, the 20th century Indian spiritual teacher, into the right half of "The Ending of Sorrow," a powerful painting that underlies the exhibition's unifying notion  hope  identified by curator Teleza Rodriguez in her gallery notes . But there is another theme that ties the work together. It is of personal expression and love for family. Marsh's expression can be seen, to some measure, in the paintings in which she is the subject, including the sadly beautiful "The Ending of Sorrow." Dominguez's expression takes a little background information to fully appreciate. The giant rosaries are laden with religious symbolism. But they are also personal icons for Dominguez. Two of them hang on the wall and run down onto the floor, replicating in large scale the rosary that Dominguez's grandmother kept on a hook. When she would take it down to say her prayers, he recalls, all the kids got quiet  out of respect, maybe, out of a desire to avoid getting in trouble, you bet. That connection illustrates the family theme that pervades the work. Family is most easily seen in the room with a pair of pieces titled "Anton's Flowers," one a gorgeous 2002 reflection-filled still life by Marsh, the other one of Dominguez's signature "dish" sets that turn cups, saucers and plates into a beautiful blue-and-green-dominated ceramic garden. Also in the room is "Anton's Rock," one of a handful of Dominguez maquettes in the show. Anton is Marsh and Dominguez's son. He can be seen in his mother's arms in the appropriately titled "Sanctuary," the painting that is hung in the center of the gallery and is the first object a viewer sees when entering the exhibition. On the floor in front of Marsh's powerful portrayal of mother and child against a barren river landscape with birds flying above is "Diane's Gems," a pile of Dominguez's ceramic "gemstones" he named for his wife. The other themes of the exhibition are equally as compelling as the spirituality and emotional connection that is evident between the couple's work. Marsh's "landscapes" extend from the spiral nebula depicted opposite a crying woman in "Rage, Rage Against the Dying of Light" to a Platte River-like view with a crane flying above in "Passages" to the New Mexico desert depiction in "To Heal an Unfinished Life." Marsh's paintings pairing landscape with portraits are echoed in a set of Dominguez torsos. Two torsos, one male and one female, are done in terra cotta with leaves and other designs carved into the "body." The other two are more elaborate  "Red Torso" and "Blue Torso," in which the glazings give the landscape on body rich color and a distinctive sense of motion. "Red Torso" brings to mind a fiery New Mexico sunset while its blue companion shows the rolling landscape in bright daylight. This exhibition is the first time that Marsh and Dominguez have shown their work together. Through its insightful hanging and often telling juxtapositions of paintings and ceramics, I'm sure they've learned something of their connection from looking at it. I'm certain that anyone who walks into the galleries can't miss the connection between the themes in their work. Nor will it soon be forgotten. The spiritual and emotional power of the exhibition is unmistakable and makes its works resonate long after leaving the museum. That is the mark of an important, meaningful show  something that is relatively rare in any museum or gallery. In other words, don't miss "Diane Marsh & Eddie Dominguez: Parallel Perceptions of Land, Form and the Natural Condition." You've got until Aug. 28 to get to Kearney to see it. What: "Diane Marsh & Eddie Dominguez: Parallel Perceptions of Land, Form and the Natural Condition"
Where: The Museum of Nebraska Art, 2401 Central Ave., Kearney. "Top Ten Art World Encounters 2005"
At the end of each year, I take a look back and put together a Top 10 list from my encounters in the art world in the preceding 12 months. By definition, such lists are personal and subjective. But they invariably show the variety and depth of the contemporary world, whether they’re compiled in Lincoln, Neb., or by the contributors to ARTForum from around the world. 1. “Singular Expressions.” With its presentation of nine midcareer artists with solid national and international reputations, this invitational exhibition that closes Feb. 12 at the Sheldon Memorial Art Gallery is the most important contemporary art show in Nebraska of 2005 and, arguably, the most important such show ever at Sheldon. 2. "Diane Marsh & Eddie Dominguez: Parallel Perceptions of Land, Form and the Natural Condition.” This summer show at the Museum of Nebraska Art in Kearney marked the first time that husband and wife/ceramicist and painter Eddie Dominguez and Diane Marsh had shown their work together. Through its insightful hanging and often-telling juxtapositions of her paintings that frequently contrast anguished portraits with landscapes and his ceramics, particularly a series of giant rosaries, the exhibition had great spiritual and emotional power and with the inclusion of works about their son, Anton, resonated with ideas of family as well. 3. “Dan Flavin: A Retrospective.” The best big museum show I saw this year was this retina-frying gathering of 50 works by the minimalist sculptor Dan Flavin, It was at the Modern Art Museum of Fort Worth when I saw it. 6. Tugboat Gallery opens. For me, the biggest news on the Lincoln gallery scene this year was the May opening of the Tugboat Gallery. KEARNEY - Painter Diane Marsh and sculptor Eddie Dominguez have been displaying their work together for many years - but only in their living room. Their joint exhibit at Kearney's Museum of Nebraska Art, up through Aug. 28, is a first for the married couple. The two artists had ideas about the exhibit as different as their work, but both like the dual vision that comes through in "Diane Marsh and Eddie Dominguez: Parallel Perceptions of Land, Form, and the Natural Condition." "I wasn't even convinced" about the idea of a joint exhibit when she agreed to it, said Marsh. She said she hesitated at curator Teliza Rodriguez's plan because her work is much different from Dominguez's. There are different color palettes, different media, different styles to the work. It wasn't until the opening reception, when she saw the exhibit in MONA's east galleries, that she realized it worked. "I thought the show was powerful, and just beautiful," she said. Dominguez said he liked the idea of a joint exhibit from the beginning. Sure, he and Marsh have different approaches to art, he said, but hey - it works at home. "I also know that in our house there's one of her paintings and one of my pieces, and there's no conflict," he said. Dominguez, an assistant professor at the University of Nebraska-Lincoln, creates large ceramic sculptures in brilliant colors. The exhibit includes some of his earlier work, such as a dinnerware set in the shape of a flower garden, but most of the pieces are very new. Dominguez said his rosaries, torsos, crucifixes and other work came through a spiritual search, prompted partly by the death of his mother. "They all sort of happened at the same time," said Dominguez, adding that he becomes aware of the meanings within his pieces as they happen. For example, he'd long been interested in figurative art before trying the torso sculptures, which he later realized echo the shape of the crucifix. Marsh, who lives and works at the couple's full-time home in New Mexico, paints very large figures that show intense emotion. They are often juxtaposed with objects that give insight into the emotion. Marsh said the size of her work, and its realistic style, come because she wants to show basic truths about what it's like to be human. "I'm trying to tell the truth as I know it," she said. "I feel like if I'm telling the truth about what it feels like to be human . . .it will be true for other people as well." Marsh said her work can disturb viewers, because it asks them to look at emotions they may not want to deal with. Dominguez said that intensity in Marsh's work gives it something in common with his own, though he describes her paintings as "soft bold" compared to his "hard bold." Her colors are soft, her surfaces smooth and her images are ethereal, Dominguez said, while his colors are bright, surfaces harsh and images solid. But they express a similar vision, boldly. "And that's kind of like our life," Marsh said. Roswell Artist-In-Residence Program artist Diane Marsh currently is exhibiting recent work at the Roswell Museum and Art Center. The electrifying seven piece exhibit can be seen in the Winston-Marshall Gallery now through Dec. 29. For Larsen, Marsh's art is as complex and multi-directional as the “conceptual art” movement with which she shares her age. Her uses of visual realism are only an adjunct to her call for repentance, self-realization, and salvation. Visitors to the museum may view Marsh's work 9 am to 5pm Mon. through Sunday. Diane Marsh depicts people in her art work. But her emotionally charged, psychologically revealing, hyper-realistic paintings are far from stiff,traditional portraiture. Instead, Marsh uses her prodigious technical skills to show us people in the midst of intense introspection, coping with unstated difficulties and finding solace outside themselves. Six of Marsh's works are on view through May 11 in the governor's Mansion Art Gallery. They serve as a striking coming-out party for Marsh, who moved to Nebraska from New Mexico a couple of years ago with her husband, acclaimed University of Nebraska-Lincoln ceramicist, Eddie Dominguez. Marsh who has an MFA from State University of New York at Buffalo, has had one-person shows in New York, New Mexico, California and Colorado. The current exhibition is her first solo show in Nebraska and establishes her as one of the state's best figurative artists. That is instantly evident in the two studies in the show. “Study for Deer Heaven”(1993) is a showcase of Marsh's skill with a pencil, full of fine detail captured only through close observation and a talented hand. 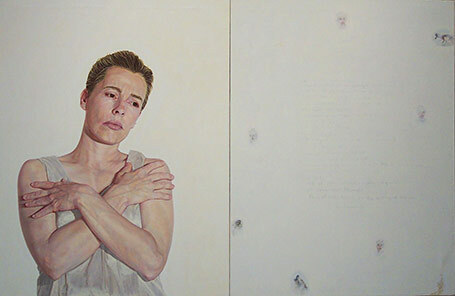 With “Study for an Unlived Life,”(1994)Marsh uses oil on paper to create an almost photographic image of her female subject, with blue veins visible beneath the skin, precisely delineated wrinkles, red cappillaries in the eye and a perfect blending of pinks, whites, blue, gray and yellow to make up the skin tone. Painting either herself or her friends, Marsh captures a moment in much the same manner as Robert Longo and as Sandy Skogland and others of the genre, she uses her brushwork to convey psychological content, not to show off in and of itself. Three of the four paintings on linen use a diptych form, pairing the subject with another panel. The fourth is a large 1986 painting “Hold Me/Save Me” in which a couple cling together, his head against her chest and arm around her waist, her arms cradling him against her body.The emotion in that scene is evident. But the details, from the shadows and shading down to his skin flaws and reddened eyes, make the painting that much more effective. Two of the diptychs use landscapes as the object of their subject's contemplation, suggesting that either the forest of 1991's “Do Not Go Gentle” or the desert vista of 1998's “To Heal an Unlived Life” is the escape from whatever it is that is troubling the subject. The ambiguity there seems to demand what moviemakers call a back story-filling in the blanks about the life and emotional condition of subject, a young man in the first case, the same woman from the study in the latter. There is however a universal understanding that comes through the work. The paintings aren't necessarily easy to look at. They're beautifully done, but not traditionally beautiful. Bit is in their slightly unsettling appearance that they achieve their emotional resonance. Small but powerful, “The Awakening” conveys the sense of a move out of sadness through a revelation of hope.In a sense, that's the theme of all of Marsh's work. The governor's Mansion Gallery, located in the lower level conference room, is open to the public on ly on Thursdays from 1 to 4 pm. That means there are five more opportunities to see Marsh's paintings and drawing before her show closes. Don't miss it , and be sure to allow enough time to contemplate the pictures. They're worth the effort. She stares out of the canvas at the viewer--at nothing. She seems frozen in a moment of deep anxiety, preoccupied with her thoughts. Who is she? In a sense, she is the artist, for this is an intensely realistic self-portrait. But at the same time, this woman and the other individuals depicted in the work of New Mexico artist Diane Marsh, now showing at the Robischon Gallery, are actors in a larger drama. Marsh's harrowing paintings are far from the stiff, idealistic poses of conventional portraiture; these intimate pictures hum with a sense of story. Large, glowing canvases cradle the heads and shoulders of Marsh's models (usually the artist or her friends), a soap-opera-style composition that amplifies the dramatic, overlit atmosphere. The painstakingly rendered faces reveal the myriad shades of pink, white, blue and yellow that collectively make up human skin tone; Marsh's control is so precise that we can clearly read the subtle flush that indicates the approach of tears. Snatches of poetry and tiny archetypal images float above her subjects' heads like ghostly thought balloons. In the oil-on-linen painting "Prayer," Marsh manages to capture both physical and spiritual existence with extraordinary deftness. The model (Marsh herself) is posed with clasped hands against a heavenly pink "sky," eyebrows wrinkled in concentration, face transfixed with despair. Hidden in the luminous background are a rose, a cross, the scribbled words of a prayer. In "Deer Heaven," she augments an oil-on-linen self-portrait with a prairie landscape and a poem, each enclosed in a separate section of canvas. This juxtaposition offers tantalizing clues as to the thoughts of the distraught woman on the right: Is she worried about the dwindling deer herds? Does she, too, feel hunted, as the words of the poem suggest? The nakedly revealing surfaces of Marsh's paintings provoke more questions than answers; the urge to know their secrets is irresistible. Equally mysterious but blissfully removed from human torment, Scott Greenig's compact, ornate paintings complement Marsh's confrontational style. Diane Marsh, Scott Greenig and Linda Herritt, through November 12 at Robischon Gallery, 1740 Wazee Street, 298-7788. "Deep Into His Distance" Oil on canvas, 48" x 94"
If much of contemporary representational painting can be said to rely heavily on diffident attitudes, this is not the case with artist Diane Marsh who in her own way tries to ‘force the hand of destiny’ not only for herself, but for the viewer as well. She does this in order to break into a more expanded psychological terrain; and in this strategy she succeeds even if it seems at times to be against the viewer’s own will-the will to hide and dissemble in the face of ‘the moment of truth’ which reflects back at us from the unequivocal light of the mirror. In a diptych by Marsh entitled “Deep Into His Distance”, (1989) a middle-aged man sits with one hand supporting his head, his eyes half-closed, not as in preparation for sleep, but as in meditation or a deep trance. He carries the unmistakable weight of someone whose gaze has gone far within to some unknown territory that is suggestive of a moment of internalized realization unadulterated by any means of exterior mediation. This “everyman” figure (in fact an image of the artist’s father) confronts perhaps his own mortality, or a fleeting sense of failure, or personalized loss, but there is no one key to reading the psychological content except that the moment is a grave one, and the direction of gravity is toward an introspective place where body and soul come together to form a meta-physical horizon line, or vanishing point to feeling. The other half of the diptych is an exquisitely rendered wave near the shoreline of an oceanic infinity, and that wave has just begun to crest and soon the force within that form will become scattered into its constituent elements as it washes up on the beach. The two images taken as one whole suggest a highly condensed situation that brings the viewer to a threshold where concrete reality merges with a vast plane of abstraction. “Deep Into His Distance” represents a high water mark of achievement in the career of painter Diane Marsh. Using a painstaking technique that one could refer to as hyper-realism, Marsh paints the figure as a vehicle to realize moments of heightened psychological content. Yet Marsh steadfastly maintains that these paintings are not about the figures she paints. She states: “My work is not about realism…These paintings are not intended to be portraits in the traditional sense of portrait painting…Rather they are portraits of humanity…I do not consider this work to be entirely in the tradition of figure painting. I went to art school in the 1970’s and my work is grounded in the ideas of conceptualism, minimalism, abstraction, media and film. Media and film had a great impact on many artists of this time”. This statement may seem a paradox in lieu of the fact that Marsh focuses so intently on the figure to carry the weight of her ideas; and she paints these figures with an impeccable style of realist rendering so that many viewers call her a photo –realist painter, a category that she firmly eschews. Marsh is quick to point out that although she may use a photograph or many photographs, or a mirror, or look out the window to paint the land and incorporate that, it is her sense of color, space, and light that dictate the overall quality of representation that evolves in each painting as the psychological content rises to the surfaces of her consciousness. These spiritual, transcendent and intuitive aspects of her paintings come into being through the act of painting and are not pre-arranged or dictated by photographs. One perceives in Marsh’s work a highly torqued form of a distillation of ingredients-a condensation of materials that brings the viewer back to some abstract point: a new beginning where the flesh becomes word and the word is entrained with a carefully distilled drop of emotion that reverse the direction of creation: An inverse expansion that begins at the level of the concrete and travels toward the unknown, or toward some greater vastness that envelopes all human beings in their constant struggle to become conscious. The people in Marsh’s paintings convey a sense of emotional realization or confrontation, or even the weight of personal disbelief as they appear to us at the threshold of the known and the unknown. They appear as a “naked singularity”--- a point of suspension between the imagination of the artist and a pull toward dissolution; and by this I don’t mean dissolution in the sense of annihilation, but as a cross roads in the matrix of existence where all the forces that come to play upon our psyches meet and merge and cancel out the objective particulars in favor of an abstract ‘moment of truth’. It is at this juncture of the subject and the object that Marsh commits to the probability that meaning exists---and the act of rendering the potential for meaningfulness becomes a highly developed form of SELF consciousness. By the concept of SELF, I do not mean this in its narrowest definition as a vehicle for ego transactions, but as a concept that symbolizes that vast inner plateau of “the figures and fantasies born of the imaginative heart”. 2. Marsh agrees that what she attempts to paint is not a portrait of someone grieving, for instance, but an approximation for that process whereby an individual begins to face all that lies below the surface of the objective world---begins to face, as it were her or his soul. As a young painter Marsh used the figure, but usually combined it with a bold sense of pattern and color. In her late 20’s however, Marsh (who is 36 years old at the time of this article) phased out the use of pattern and all referents to objective reality in favor of a reduction in the amount of information in order to concentrate of a technique to probe the inner reaches of the human psyche. As her work evolved, the intensity of the psychological content became the foremost intention of her painting. Marsh states: “I want these paintings to be a statement about all human beings...I want them to be as timeless as possible. I want them to be about universal issues that confront us all and illuminate what it means to be human at this point in time. At the present time, Marsh is involved in her diptych series that she began in 1987, and that she feels embodies her strongest and most heartfelt concerns. In the diptychs there is the suggestion of a quest for trans-personal meaning beyond even the nature of the self. In the diptychs there is paired with the figure some representative view from the natural world as in the breaking wave of “Deep Into His Distance” (1989) or a filtered sun as if seen through dense fog in “Moving Toward Light” (1988), or a view of a distant galaxy that is paired with the image of a distraught woman in a work called “Rage, Rage Against the Dying of the Light” (1990). In all of these diptychs Marsh is trying to suggest that the life of the soul is inextricably and fundamentally bound to the world of nature. Beyond even the ultimate truths of our own human nature, there is the seemingly infinite and ordered phenomena that constitute the natural world around us that we cannot be separated from under peril of our continued evolution. Marsh passionately believes we shouldn’t alienate ourselves form nature because we originate from there and we are totally apart of it in spite of these contemporary times where our relationships to nature are being constantly tested, obstructed, and destroyed. “Without man’s reflecting consciousness the world is monstrously meaningless: for according to our experience man is the only creature that can determine “meaning” at all”. 3. The probability that meaning exists within the confines of Diane Marsh’s practice is great. If meaning were to be limited only to the concepts of SELF consciousness that she pursues in her work, then the ability that Marsh has to bring the viewer to the threshold of other levels of awareness that lie behind the concretization of reality is beyond question. Her seriousness of purpose and her distinct ability to realize that purposefulness is a force that sets our inner world in motion once again---expanding it outward and toward a form of symbolic dissolution and to a new act of creation having originated in a single drop of highly distilled awareness. And for Diane Marsh, the increments of her awareness are the differentials of her evolution.